With 78% of adults owning a smartphone, should local authorities deploy mobile apps as well as websites? They can provide a clearer and simpler user experience for smartphone users, but creating them involves dealing with a duopoly of mobile device operating systems, duplicating effort and considering security risks. 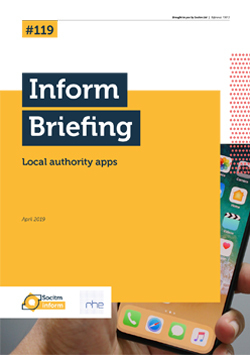 This briefing includes data and links to 145 local authority apps hosted by Google’s Android Play store, as well as detailed case studies on Cardiff, Perth and Kinross and Aberdeenshire. It looks at library services’ widespread adoption, along with apps used by councils to report location-based issues with waste/recycling and highways, as well as for staff use.